BROCKTON, Mass. 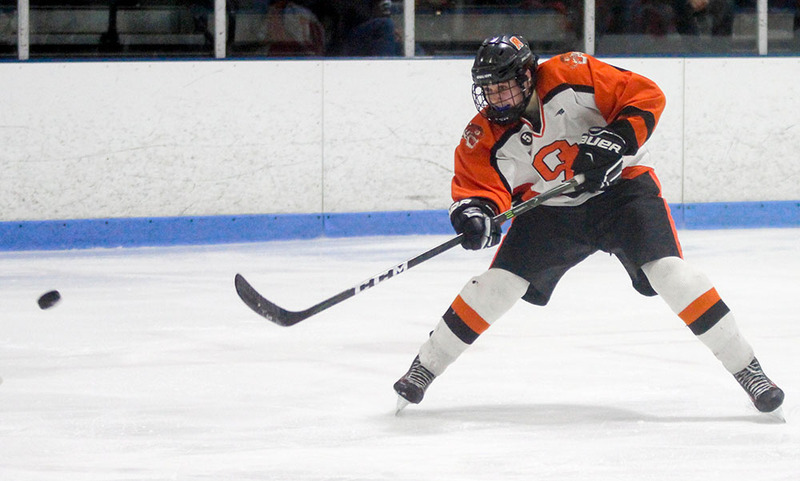 – Oliver Ames had three sophomores score a goal apiece and the Tigers overcame a half dozen penalties over the final two periods to land a key, 3-1, division win over Mansfield. Sophomores Max Ward, Brett Williams and Collin Bourne each found the back of the net while junior goalie Zach Walsh made 19 saves in the win. While the Tigers had seven players hit the penalty box over the final 30 minutes, their ability to kill off man-advantage opportunities for Mansfield resulted in momentum gained for OA. The 5-on-3 Bertoni referenced was Mansfield’s first power play opportunity that came early in the second period. After a delayed interference call, the Hornets were able to keep the puck and draw a hooking call to get a two man advantage. Despite having a full 1:30 with the two-man advantage, Mansfield registered just two shots on goal. Oliver Ames capitalized on the momentum gained from the kill, scoring the opener just 30 seconds into being even strength. Ward, who had a penalty shot saved in the first period by Mansfield goalie Tony Rullo (21 saves), blocked a clearance in the offensive end and went right to goal and tucked the puck in to make it 1-0. Mansfield nearly tied it a minute later when Matt Farragher had his shot saved by Walsh and the rebound chance was scoffed. The Hornets had a power play with 6:43 left, and then again with 3:00 to play but couldn’t find the back of the net either time. “It wasn’t ideal – we were 1/6 on the power play and that includes the 5-on-3 for 90 seconds,” said Mansfield head coach Mike Balzarini. “That’s not what we want. We moved the puck well on the 5-on-3 but we maybe have two shots. We’ve been focusing more on our penalty kill, which was great tonight, but we just have to get back to basics for offense. The guys know the premise but we were trying to rush it. The Hornets once again went a man up with 5.3 seconds to play in the second. After a quick save, Mansfield once again won the face off and a quick shot resulted in a rebound right to freshman Ryan Sullivan. He batted the back into the back of the net as the horn sounded and the referee declared it a good goal to tie the game 1-1 through two periods. Oliver Ames again went down a man just 2:31 into the final period on a high sticking call but the Hornets couldn’t convert. In fact, the Tigers had the best chance on a shorthanded attempt with Bourne streaking in but his back hand attempt sailed high and off the glass. OA was whistled for too many meant with 10:49 to play but Mansfield couldn’t get anything going on the offensive end. With the puck in the defensive zone and the power play over, the Hornets went for a switch but a failed clearance resulted in the puck on the stick of Williams and he took one stride towards goal before unleashing a shot off the iron and in to make it 2-1. “Our forecheck is pretty effective when our first line is on the puck hard, stick on stick and body on body,” Bertoni said. “Brett Williams, who’s having a good year for us, picked up the puck and buried one which was huge. We’re very effective on the forecheck. Mansfield killed a late penalty and then pulled Rullo with a minute to go. But OA won a face off in the defensive zone and Bourne raced out with the puck to bury the empty net goal to get to the final score of 3-1. Oliver Ames (7-3-1 overall, 3-1-1 Hockomock) will try to extend its unbeaten streak to six when it visits Franklin – Bertoni’s alma mater – on Saturday. 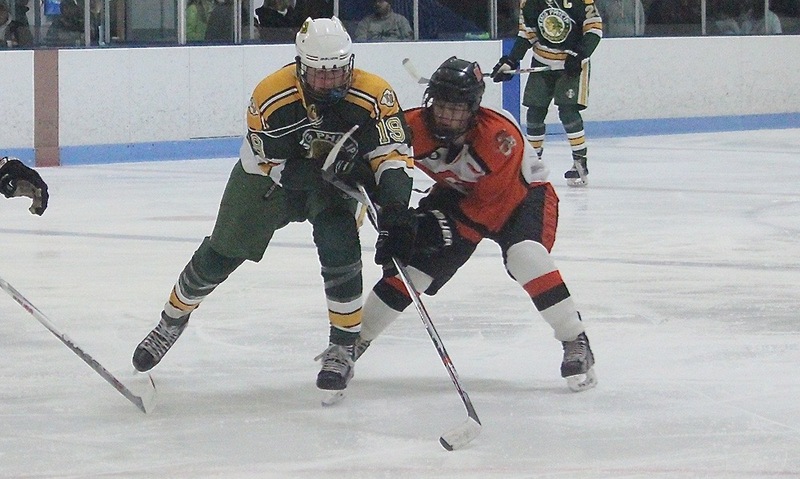 Mansfield (5-5-1, 2-2) will look to bounce back when they take on King Philip at Foxboro Sports Center the same day. BROCKTON, Mass. – The puck dribbled free, deep in the Canton zone, as Oliver Ames goaltender Zach Walsh skated to his bench. Before the extra skater could enter the offensive zone, Canton forward Ryan Nolte corralled the puck and sent it the length of the ice into the empty Tiger goal. Nolte’s simple flick put the finishing touches on the Bulldogs’ 2-0 victory over Oliver Ames at Asiaf Memorial Ice Rink on Wednesday night. The Bulldogs dominated play in the first frame outshooting the Tigers 10-3. But Walsh kept the Canton offense in check for the first half hour of play, totaling 28 saves on the night. 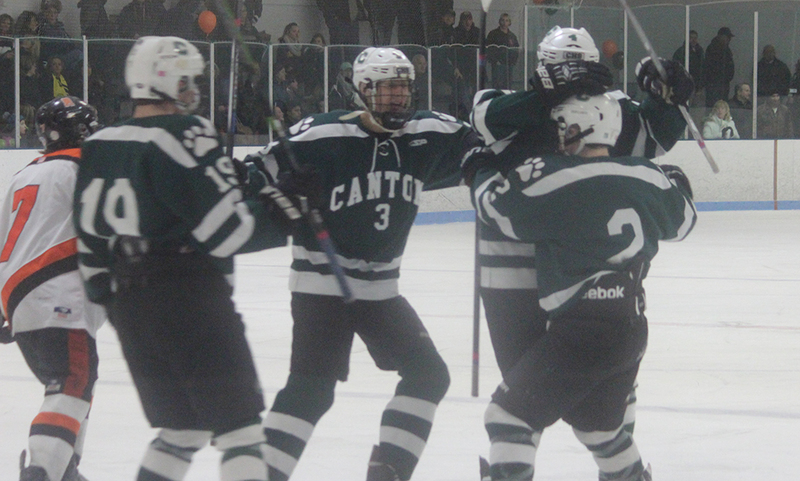 As the first period carried on, Canton’s offensive pressure intensified. Canton forward Mike Dadasis ripped a shot off of Walsh and the juicy rebound bounced unguarded in front of the net. Walsh denied Jack Goyetch’s rebound opportunity with another flash of his leg pad and Oliver Ames escaped the zone. Oliver Ames struggled to land shots on goal tallying only 14 shots. A strong fore-check coupled with aggressive neutral zone play from Canton limited Oliver Ames’ offensive chances. Canton’s persistent attack finally broke through midway through the third period. Dadasis entered the zone with speed along the far side boards. He slid the puck to a streaking Bubba McNeice, who rocketed a back-hand shot to the short side top left corner of the cage. “We needed a play to be made because we had some chances we just couldn’t seem to bury,” Shuman said. Canton scored multiple goals in a game for only the second time this year while Oliver Ames failed to score in its second straight appearance. Canton goaltender Quinn Gibbs stopped 14 shots for his first shutout of the season. 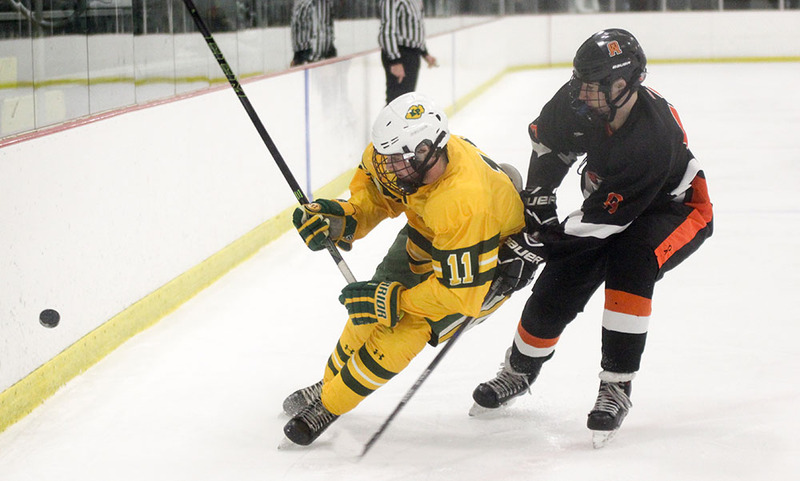 Up next, Canton (3-2-1) hosts King Phillip at 4:00 p.m. on Saturday at the Canton Ice House. Oliver Ames (3-3) travels to Wellesley on Monday at 4:00 p.m. at Babson Skating Rink. BROCKTON, Mass. – It certainly wasn’t an ideal start for Canton on Saturday evening, but the response from the Bulldogs definitely was. After going down 1-0 in the opening minutes, Canton responded with the tying goal in the first, two tallies in the second and three more in the final period to score a 6-1 non-league win over Oliver Ames. Less than 20 seconds into the game the Bulldogs went down a man on a four minute major boarding call. Oliver Ames was able to take advantage on the power play with freshman Max Ward taking a feed from classmate Brett Williams and banged one of the iron to put the Tigers ahead. But as the period went on, the Bulldogs started to get their legs. Less than 30 seconds into their first power play, Canton junior Tommy Kilduff — the guilty part from the Bulldogs’ early penalty — got a piece of DJ Trerice’s shot from the blue line to knot the game. OA goalie Zach Walsh kept the score level with a big save on Canton’s CJ Martin with less than 10 seconds to go in the first and then stopped an odd man rush from the Bulldogs, stopping Seamus Pecararo’s wrist shot and then gobbling up the loose puck just before it crossed the line. But midway through the second Canton was able to take the lead for good. After the puck was thrown towards goal, a scrum ensued but senior Bobby Mullaney was alone at the post and lifted a backhand right over Walsh’s stick to make it 2-1. Less than two minutes Canton converted at the tail end of a power play. Trerice went across the blue line to Martin and his wrist shot through traffic – with Kilduff playing a big role in the screen – and found the back of the net to make it 3-1, a lead the Bulldogs took into the second intermission. Kilduff got his second of the game with just over five minutes gone in the final period. With OA looking to clear it out of their own zone, Kilduff swooped in to pick the pick uff and went in alone, pulling a quick move before roofing it to make it 4-1. Canton went on another man advantage and cashed in nearly right away with senior Matt Lazaro rounding around the boards before finding Mullaney in the middle for a one timer. Junior Jackson Maffeo also assisted on the play. In the final minutes, Kilduff came away with another turnover, this one in the neutral zone and skated in with an odd man rush along side senior Andrew Gelerman. Instead of going for the shot to try and complete the hat trick, Kilduff unselfishly dished it off to Gelerman. The shot was just wide of the post but Kilduff was rewarded for his unselfishness as the puck bounced off the boards right back it him on the other side of the goal for a tap in to make it 6-1. Canton finished with a 24-19 advantage in shots. Canton hockey (13-2-2, 9-0-1) will take on Coyle & Cassidy in the first round of the Joe Quinn Memorial Tournament at the Raynham IcePlex on Tuesday at 7:30. Oliver Ames (9-7-1, 7-3) will travel over the Bourne Bridge on Monday to take on North Reading in the first game of the Jeff Hayes Memorial Tournament.